Yesterday one of my Facebook friends asked a really thought-provoking question—"Do you think the people around you make you who you are?" My knee-jerk answer was "no". But then I had just come back from a dinner with family members where it was clear we all shared similar senses of humor. And that wasn't just coincidence. It was something that has been passed down through generations and distributed among all the branches of the family. So what then came into my head was this funnel graphic I put together using my own progression as illustration. So, for others, that orange part might last longer or shorter. Some may never progress past the childhood or teen years. 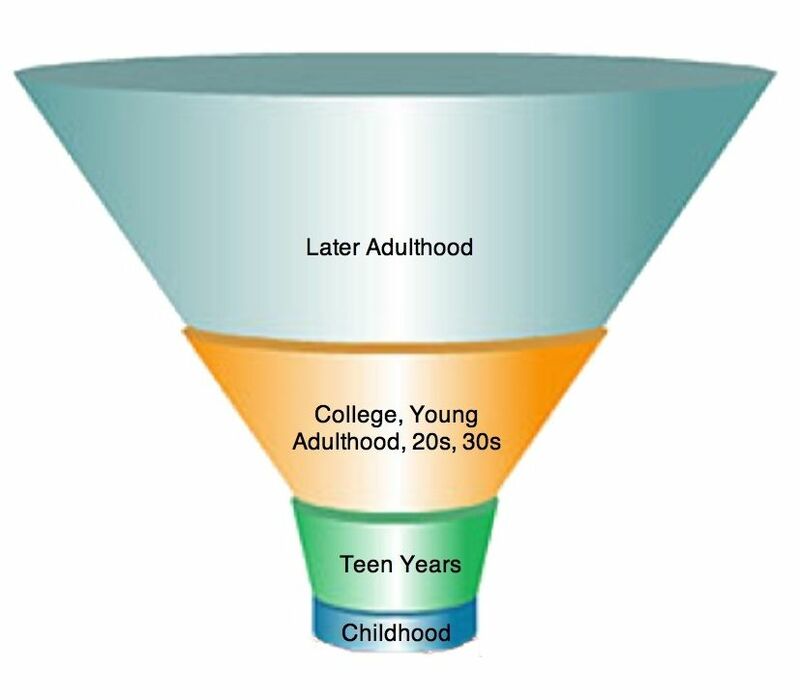 But, bear with me here, the funnel is just a shape. It's not a funnel. The narrower parts are meant to illustrate the amount of "shaping pressure" outside forces have on you. So where it's narrower, there's more of an impact from the outside, pressing that core tight like a diamond. Where it's wider, there's less of an outside impact, hugging you gently and leaving plenty of wiggle room for changing and growing. Ultimately, my response to my friend's post was that these days, I mostly make me who I am and adjust the people around me accordingly. But there is a core within me that was created by my family experiences and the influences of others. That core, however, is not set in stone. You can chip off the parts you don't like and exchange them for better behaviors. It all comes down to two things. The first is conscious awareness of what you do and why you do it. You can't really create change unless you know what you're changing and why it continues to cycle through your life. And the second thing is a belief and desire in your own ability to change. I think a lot of people are lacking conscious awareness of what and why they do. Or maybe they're aware, but feel trapped by it because it's "how I was raised" and they're not aware of their amazing power to change. Then there are some cases where a person is too lazy to change, not into change or change feels insurmountable at the present time. There are all kinds of sayings out there that support the notion that a desire to change is fruitless. "A leopard never changes its spots." "You can't teach an old dog new tricks." But all of that is BS. You can shape and mold your life into anything you want. Our early childhood creates a core of who we are. For me, things like the work ethic that was ingrained in me, my sense of humor and my sense of right and wrong are all things that were valuable for me to keep. But every family also has toxic or dysfunctional behaviors that also become ingrained in us. And, if we want, we can change those things. We can change anything about us that we don't like. We have all known people who are stuck in grade-school behaviors or who allow dysfunctional behaviors to overpower their better qualities. I imagine we have all behaved in certain ways—ways that feel automatic to us—then felt bad about it afterward. One of the things I know I picked up from my formative years was a temper. It still pops out from time to time, but far less than it used to because it's one of those things that I didn't like and worked hard on changing. So I'm a lot less temperamental these days and, while I'm still not the best at expressing my anger when I do "lose it", it's rare for me to lose it anymore because I became conscious of that moment when choice is available...there is a millisecond there where you can choose to lose it or not. Prior to becoming aware of what and why I do, I didn't know that moment existed and allowed the behavior to control me. Now it is much more within my grasp. I see our early years as being shaped by a force we cannot resist—or a force, perhaps, we're not aware we can resist. As children, we're putty in the hands of those around us. We all swear we're never going to be like our mothers, for example, then grow up to be just like them. But none of it is etched in stone. Because once we become conscious of our behaviors and our ability to change them, whatever "you" you may feel trapped in becomes just an excuse. Once you get past childhood, you're able to expand and do the real work you came here to do, if that's what you choose. As you move along your path and become more powerful than the outside forces (family, society, friends) whose influences can easily shape you, you may find your relationships changing. Change enough of those core things and you may find you no longer fit well with your family or friends. But another family will form...a family you choose from the people who reflect and embrace the you you've become. We are who we are because we're human. I am who I am because I'm an American. And an east coaster. And a Sadler. All of those things have undeniable impact on how I walk through life. But the me I came here to be is the me I've created. And it took a long time, but I think I've finally reached a point where I'm not going to apologize or feel bad for not being the me I'm expected to be or the me that others find me comfortable or convenient to be. I'm consciously shaping the influences I choose to have around me instead of letting the influences I have around me to determine what shape I take on. And thus, my funnel is widening. Another wonderful post that hit home. Well done! I am just happy that I found out that I can change things I don't like about myself, at a fairly early age My only concern now is how I have managed to mold my own children!